PC gaming company Razer is set to raise upwards of US$504 million (HK$3.9 billion) when it lists on the Hong Kong Stock Exchange on Monday. The company, which develops gaming-focused accessories for PCs, laptops and is preparing to sell its first smartphone, today priced its shares at HK$3.88, or US$0.50. That comes in towards the high-end of its HK$2.93-HK$4.00 price range set last month. The listing would give the firm a market cap of US$4.4 billion, which is more than double the US$2 billion valuation it commanded in its last round of venture capital investment. The U.S.-Singapore company first filed to go public in Hong Kong back in July, and it confirmed that it has sold a total of 1,063,600,000 shares in its listing. The total raise of US$529 million doesn’t include fees and services which, when deduced, leaves a take home of US$504 million. That amount could be higher still if underwriters take advantage of their green shoe option. The listing follows the wildly successful IPO for Tencent-backed China Literature, which raised over US$1 billion and saw shares jump 86 percent after its first day of trading. Perhaps profiting from the close timing, Razer has already seen brisk demand for its stock. On that note. If you’re wondering why an in-demand stock isn’t priced at the absolute top of its range, consider Chinese superstitions. The number four is unlucky in Chinese culture — it is synonymous with death — whereas three and eight are positive. So a $3.88 share price, which signifies ‘prosperity from birth,’ is a far luckier start than $4. That’s a pretty unique way to kick off life as a public company, but perhaps it isn’t too surprising given that Razer planted a number of Easter eggs in its IPO prospectus — although they aren’t too easy to spot in the monster 345-page document. Three-quarters of revenue comes from the sales of PC accessories like gaming mice, souped up keyboards, specialist headphones and more, but the firm branched into PC devices with the Razer Blade, a high-performance laptop dedicated to portable gaming that costs more than US$2,000, and it bought audio-visual brand THX in 2016. Despite the price, margins on the Blade are low at under three percent. 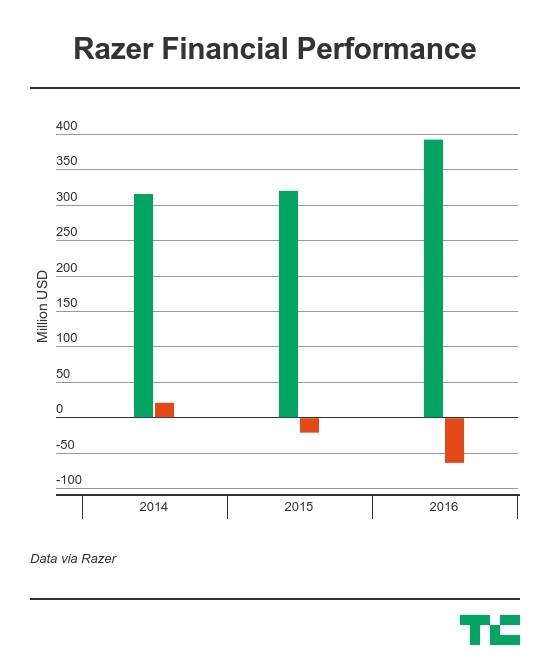 That’s yet to come and Razer can point to being profitable in 2014 — to the tune of US$20.3 million — before losses in 2015 and 2016, US$20 million and US$59.6 million, respectively. The former, it said, was largely down to the cost of an aborted U.S. listing, while its most recent financial year saw an increase in stock options and more R&D. Excluding that compensation, Razer’s loss for 2016 was a more modest US$20.6 million. There’s precious little analysis on the peripherals space but a report commissioned by Razer itself concluded that gaming peripherals were a US$2 billion market in 2016. With the base of global gamers predicted to jump from two billion in 2016 to 2.7 billion in 2021, Razer is pitching investors on that opportunity coupled with its forays into mobile, AV, services and payments. Razer CEO Min-Liang Tan will join us at the TechCrunch Singapore Meetup on December 23 to discuss the IPO, and how the business has developed into a public company. Also attending will be Nick Nash, Chairman of Sea, which raised US$880 million in a NYSE public listing last month. We’ll be publishing details of ticket availability for the event next week, so stay tuned.